In Andalusia it is still possible to ride through the most unimaginable landscapes for several days, combining nature with the most ancient traditions. To the West of Sevilla, this equestrian vacation takes riders on the pilgrimage roads to El Rocío. Leaving from the south of Sevilla, we will ride through the olive groves and the orange trees, in blossom in the early spring of Sevilla. We will visit some private Haciendas and follow the Caminos to El Rocío, a traditional pilgrimage to this unique white village, home of the sacred Virgen del Rocío and named the International village of the horse. All the houses have stables and all the streets are sand tracks. In the times of the pilgrimage, this village hosts thousands of horses - many of them Andalusian stallions. The Doñana nature reserve stretches of a 100,000 hectares protected area and it is one of Europe’s most valuable natural landscapes. The landscape of this area is of great diversity: forests of pine and savine, eucalyptus and cork oaks; dunes, marshlands and preserves. Thousands of birds come to spend the winter in this paradise. Ride through the lesser known parts of the reserve, the hidden lagoons, the shrub forests and the dunes, we will reach the most Southwestern coast of Spain and the never-ending empty beaches of Doñana. The horses are Hispano-Arab, Anglo-Hispano Arab and Andalusian breed ranging in height from 15 - 16 hh, and selected for their good nature and endurance. The horses have been carefully bred and trained by Alfonso Gonzalo de Bustos, a great horseman, who is an expert in Andalusian dressage or Doma Vaquera, and passionate about all the Andalusian traditions. At present, he is competing in TREC. The horses are excellent, quite spirited, fun–to–ride, very well-trained and very fit. Exploring Doñana National Park, which is one of Europe’s most valuable natural landscapes. The landscape of this area is of great diversity: forests of pine and savine, eucalyptus and cork oaks; dunes, marshlands and preserves. Thousands of birds come to spend the winter in this paradise. Stay and experience Spain's famous fincas, country homes where equestrian pursuits have always been part of their history. Visit the famous pilgrimage site of El Rocio. Lodging is very comfortable and full of charm. The Cortijo de La Corbera, where the ride starts and ends, has accommodation in the finca, eight beautiful bedrooms, charming and with all the facilities. The Cortijo Ardea Purpurea (Purple Heron), in the boundaries of the Doñana Park has been built in the traditional country style, with thatched roofs and wood beams, and it has the atmosphere of a charming lodge. In the magic village of El Rocio, we’ll stay at the Hotel Patp Malvasía, one of the traditional houses of this horse village, which has been restored as a comfortable hotel with beautiful views of the marshlands. The last two nights, new to this ride, will be spent at the luxurious Parador of Mazagón 4*. It is situated right on the Atlantic coast with the best views of the ocean and direct access to the beach. It has a beautiful garden with a swimming pool and spa, a great way to end this exciting week ride. A support vehicle will follow the riders during the entire trip, meeting for aperitifs, meals and at night. Breakfast, aperitifs, lunch and dinner are included while on the trek. The local cuisine is excellent and much consideration is taken when planning the meals to provide visitors with a sampling of the many different dishes produced in the area. Lunch is usually a picnic in the countryside with set tables, chairs... and small feast everyday! Some lunches will be cooked on the spot; others prepared the village bars o restaurants, always exquisite. Dinner is at the hotels will feature a varied selection of the typical cuisine. The usual schedule for meals: Breakfast 8.30. Aperitif at 12.30pm. Lunch at around 2.00pm. Dinner is usually served at 9.00pm. Ride through the olive groves and the orange trees, in blossom in the early spring of Sevilla, visting private Haciendas and follow the Caminos to El Rocío, a traditional pilgrimage to this unique white village, home of the sacred Virgen del Rocío and named the International village of the horse. All the houses have stables and all the streets are sand tracks. In the times of the pilgrimage, this village hosts thousands of horses - many of them Andalusian stallions. Explore the pristine Doñana nature reserve with its amazing beaches and diverse birdlife. Pick up Meeting time around 16:00 – 16:30 at the Sevilla airport – or at the Santa Justa train station if you are in Seville already. Transfer to the equestrian centre La Corbera, south of Sevilla, near Utrera, about 20-30min from Sevilla. It is a beautiful Cortijo, a traditional Andalusian country estate. Distribution of the rooms. Introduction to the horses and the stables. Short afternoon ride (1 and a half-2 hours). Sundowners after the ride. Welcome dinner and night at La Corbera. The accommodation is at the finca, with 8 charming bedrooms overlooking the countryside. This day will be a short ride for the riders and the horses to get accommodated. Ride through agricultural land and pine woods. Aperitif in the countryside. near the pine woods. Some trots and canters to the area of the beautiful Hacienda La Indiana. Picnic lunch in the woods. In the afternoon, ride back to La Corbera. Dinner and night at la Corbera. Ride will start at Torrequemada, a XVI c. Hacienda of Andalusia. After a brief visit of Torrequemada. This is a traditional stop of the pilgrims on their way to El Rocio, the Camino de Triana, from where we will start the ride. Through farming land of olive trees we will get to the pine forest for the aperitivo stop. We will follow the Camino de Triana, and stop for a picnic lunch at the Dehesa de Torneros. In the afternoon we will cross the river Quema, where the pilgrims heading towards El Rocio, traditionally are baptised! We will ride on to Villamanrique de la Condesa, to the beautiful cortijo lodge Ardea Purpurea. Dinner and night at this charming place dedicated to the Purple Heron, due to its great location for birdwatching in the boundaries of Doñana. Ride through pine woods and the Dehesa de Boyal, a forest of holm and cork oaks. We will follow the Camino de Pilas, through agricultural land and enter the pine forest, where we’ll stop for an aperitivo. Through beautiful pastures and Andalusian horse-breeding farms, we will reach the Camino de Hinojos, with very lush vegetation of umbrella pines, holm oaks, cork oaks and wild olives. Beautiful sand “caminos” ideal for great canters. Picnic lunch in the pine forest. In the afternoon we’ll reach the boundaries of El Rocío, the destination of the pilgrimage to the Virgen del Rocío. We’ll leave the horses in a farm outside El Rocío and transfer to the village. We will stay at a traditional house of El Rocío, converted into the comfortable Casa rural El Lince. Half-day ride. We will ride in El Rocío, the international village of the Horse, and visit the church Ermita de la Virgen del Rocío. It is a unique village: all the houses have stables and all the streets are sand tracks, where it is possible to canter from the church to the bar. In the times of the pilgrimage this village hosts a million people and thousands of horses! Aperitivo near the river Ajolí. Lunch at a restaurant in El Rocío. Night at the Hotel Casa Rural El Lince. Following the “Camino de Moguer”. This Camino follows the stream of La Rocina, which runs for 40km, and it is call “la Madre” and its waters area the source of the marisma – the marshlands which are the heart of Doñana. Along its banks one can often see many different species of birds and at times, deer and the wild boars, as well as a variety of plant species. Aperitif stop in the countryside surrounded by pine trees where the pilgrims from Huelva rest when making the Rocio pilgrimage. Ride to the lagoon of Rivatehilos through forest of savine and mastic shrub. Lunch near the lagoon. In the afternoon ride to the abandoned village of Cabezudos, where the horses will stay. Transfer to the Parador of Mazagón 4*. Dinner and night at the Parador. This day we will ride in the most Western part of Doñana. This area is very little known and it has a unique beauty, combining lagoons with forests of great diversity, wild shrub, rockrose, mastic, rosemary, thyme... and some spectacular wild flowers in the early spring. Aperitivo by the Laguna de la Piedras. We will gradually abandon the forests to reach the dunes, which in this part of the Doñana are fossilized. We will have lunch at the top of the dunes with our first gaze at the Atlantic Ocean. Through the dunes, we will finally descend towards the beach. 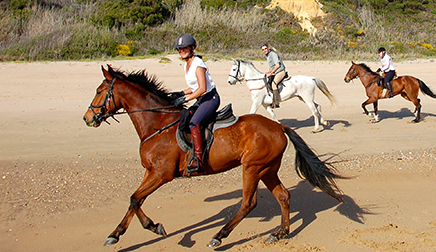 Riding along the coast for more than 7 kms, we will end this beautiful ride with some exhilarating canters on this never ending beaches of Doñana. Farewell dinner and night at the Parador of Mazagón. Breakfast and transfer to Sevilla, to the airport or the Santa Justa train station. End of the programme. ** Itinerary is subject to changes based on the weather, trip guide's discretion or other factors. Children with parents or responsible adult on the summer rides.Age : Depends on ability, minimum 14. Sevilla AVE Santa Justa train station at the agreed times (the train station is at a 10-15 min trip by taxi from the airport). Meeting time 4pm on the first Sunday of the ride.